Butterfly Fractions - A Good Approach for Primary Pupils? Fractions can be very difficult to teach. Tricks like the Butterfly Technique have been taught in schools for decades, if not longer. But should they? 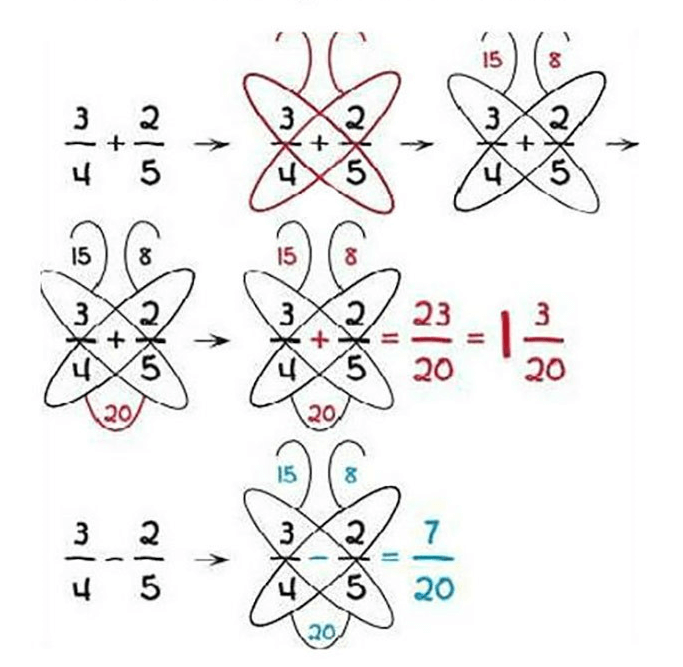 The butterfly technique is a pedagogically interesting technique that is a mechanical way to add and subtract fractions. 6. the new sum has a common denominator and is easily calculated. The way of noting this technique is to circle the relevant parts of the fraction, producing a “butterfly” type image. The worry we have about this approach is that it a mechanical way of of solving a problem without furthering the pupil’s mathematical fluency or mastery of the issues. We believe students need an understanding of a concept especially when first introduced. Tricks like this allow students to solve set problems and examples but don’t develop their fluency and so when more difficult problems are presented they may struggle. How would a student cope if they had to add three fractions together armed only with the butterfly technique? If they understood the idea behind the butterfly technique then they could solve it, but surely then they could simply look for a common denominator?